Jaejoong: An actor who had much desire for his craft?Jaejoong: Very much… How do you say… shall I say laughter? I feel that he was very much overflowing with smiles. Worries… He was someone with a lot of worries, always. To refrain from showing those worries—he tried hard to do that also. I don’t know what it was, but he always had so many worries. And the counseling on those worries—we had many of those, as hyung and dongsaeng. But I remember his face—the face that, even in the midst of them, never once lost the smile. Jaejoong: Ah… he was a singer who always worked hard, and also always worried for the sake of his fans. 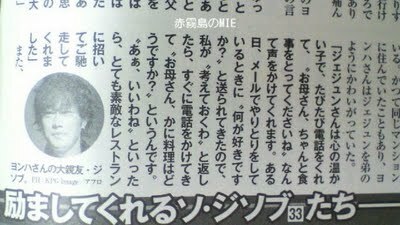 Jaejoong: A while ago… when I had gone to the United States and maybe two to three days had passed… I heard of the news. In the United States… as soon as I landed in the Los Angeles Airport, I had a call from Yongha hyung. “Where are you.” “In the US.” “Ah, so you’ve gone to the US. When you come back, let’s have a drink together.” He had said those words to me. Jaejoong: He was someone that did not give off the feel of being a celebrity, at all. He was someone like the hyung next door. When you look at the results and the feats that Yongha hyung had accomplished in his life, he had a very high stature. Despite that, he showed himself as someone who, separate from the renown and popularity of celebrities, was a human being exactly like everyone else—very often. So I feel that perhaps that is why the people around him loved very much the Yongha hyung, the man. Jaejoong: When Yongha hyung did not have too many activities in Japan, we were in Japan quite a lot because of group activities. There was a time in which we lived in Japan for six months, a year. If my contact information changed, of if the contact information of those friends in Korea changed, then we would lose touch with each other—this happened from time to time. But in my voicemail, “My number changed. Are you healthy? Your health is the most important thing, so take care of it. And I miss you. And also… even once… I should go to you, to see you.” He’d say that. But many people say that—“let’s meet, let’s have a drink.” Often, those words just end in words. But he was someone who really kept to the words that he spoke. He really came all the way to Japan. Yongha hyung… before he left… he came to see a performance of ours, in Japan. He did say that because of a schedule he had to go out in the middle, but… He was someone who really kept every word. Jaejoong: I think all the fans know. The musician or the actor they like… from behind the scenes, “how hard do they work for our sake?” I think the fans know the answer to that the best. He worried so very much. On stages that were so big, he had performed many times, and he also had so many fans. But for the sake of the fans in Japan… “from the little theatres, from the very beginning, I want to begin performing anew.” He’d tell me that in his worry, and would repeatedly ask me whether I thought that was okay. Because he had such a loving heart for the fans like that—probably that is why, even now, the fans are waiting for Yongha hyung. Jaejoong: Ah… When I think of Hyung, already laughter comes forth from me. I… from Hyung… truly so many things I think I learned from you for a long time… and to the many people around me… the kind heart that Hyung showed… I am conveying that… and I want to also show it as you did… And also, your mother, your brother-in-law, your older sisters… I would contact them, have meals together with them and such… but now that you aren’t here… really you are missed…. The place where you are now—I visit it often… and talk to you very often, but… Ah… I do not know. But, I don’t know. More than any other thing, I wish that you are also happy where you are. So that even by just looking up at the sky, we will continue to have your smile come to our minds… please, continue to protect us… I wish you’d smile down at us. Really really, I love you. Thank you. When I told him “Ah, they are good,” he invited me to an extremely nice restaurant and treated me to a splendid meal. For TVXQ, the nation’s top idol group, July of 2009 is an unforgettable moment in time. The group split up when three members, Xiah Junsu, Micky Yoochun and YoungWoong Jaejoong, filed an exclusive contract suspension injunction against SM Entertainment on the grounds that, ‘A 13-year contract is unjust’. Fans who had fallen for these five ‘pin-up boys’ were devastated; everything had looked fine on the outside when it fact, the inside had rotted and collapsed. These three members formed a new group JYJ and chose a path that was independent from their former agency. But the environment that surrounds them in the entertainment industry is not a friendly one. There are times when they must sit in dismay under the scrutiny of cold gazes. 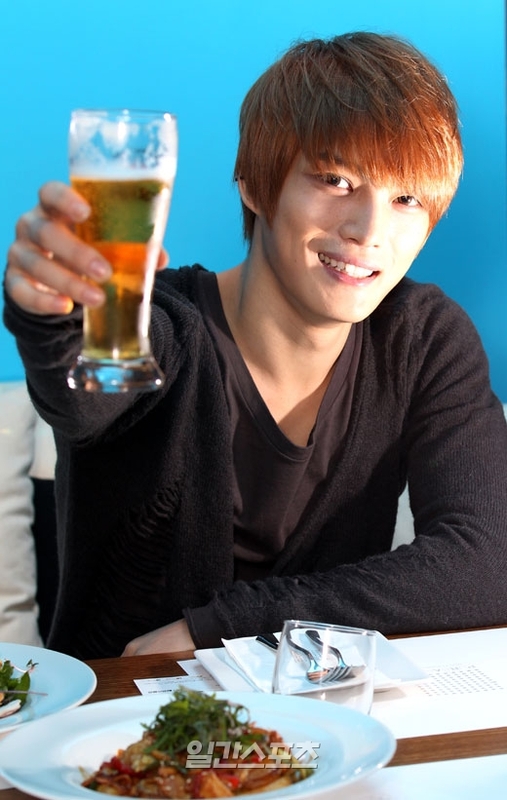 Two years after the group split, we invited Jaejoong to an interview with us over a few glasses of beer to represent his fellow JYJ members as they have successfully hit off their World Tour in Thailand. He showcased all his talents this performance by taking on the role of the concert’s director. You could still see the feeling of relief etched on his face from completing the concert successfully; his expression was bright. What stuck out the most was his white and smooth skin. -I heard that the concerts in Thailand were a hit. -Then what about the outfits of the other members? -You must have had priority because you were the director. -We’re having an interview today over a few glasses of beer, but what’s your usual drinking capacity? -Let’s start off with a difficult question. What is TVXQ to you? -You must have felt very sad during the concert. -There are a lot of your photos that are becoming a hot topic these days, but what’s this about a photo of you as a high schooler with your date? -What about the photo you took with Kang Yebin? -Who else was there at your party? -The luxurious interior of your new house also became a hot topic. -I heard that you used to live with Kim Hyun Joong from ‘Boys Over Flowers’. -How did you meet Hyun Joong? -It must be that handsome guys have some sort of connection. -Your friendship with Park Yong Ha was quite special.